Virtualization is really good for consolidating old servers onto one bigger ones. The problem however is that is the big server dies to whatever reason instead of having one small problem you end up with 10 or more small problems and usually ten small problems in a production environment is basically a big problem. So the missing component is clustering - if you could somehow make a cluster and virtualization work together... well, you can do it for Solaris Zones for quite some times and it works really good. But what about Xen (aka xVM Server) based virtualization? There is a project called ha-xvm which is to provide a Solaris Cluster Agent to do exactly that. See a demo showing that it actually works :) And yes, it does include live migration when switching virtual server to other node. ... but only if you have lots of money to spare. I totally agree with Adam. Recently I posted a blog entry on TCP ListenDrops and Listener. Since the last tuning we haven't experience even single listendrop - good. Nevertheless we started experiencing some performance issues with the same Oracle instance. The problem was that although there was plenty of CPU to spare, no increase in disk I/O and generally nothing wrong with the system at first glance, getting connected to Oracle did take even 4 seconds. Once connected the database was responding really fast. Because the connection time used to be well below 1s before the impact was relatively huge - especially when you have some programs doing couple of connections and sql queries to the database while a customer is waiting for a page to be build - almost 4s extra for each database connection and you end-up with extra 4-12s of delay for an user. So what happened? First I wanted to check if it is the database problem afterall. There was a CGI script I knew was producing the results much slower than it used to do. I was told it usually did produce the report within 5s and now it takes 8-15s to do so. Quick look around of a midlleware box and at it's historical data (CPU, run queue, network, etc.) didn't reveal anything obvious. So I quickly changed slightly the shortlived.d script from DTraceToolkit to print me a total CPU time and real time it took to execute the CGI script on a production. The real times were oscilating between 8-16s while vtime was always within 2s. What it means is that the script is definitely not CPU bound. Quick look at the script itself and it doesn't actually do much - basically two database connections and it prints parsed output. It strongly suggests that it spends most of its time waiting for the database and that's where I should focus on the problem. I tried to connect to the database using sqlplus client and it took couple of seconds even before I got a prompt. First thought was that it is the ListenDrop issue I was blogging about recently - it wasn't. So I checked if the problem is still there if I connect to the listener locally from the db host itself instead of going over a network, to eliminate everything in between. The issue was still there so it definitely wasn't a network issue (and least not per se) and rather something local to the db box. It means that the problem is somewhat related to the ListenDrop issue. It means that new connection is being backloged for almost 4s before listener picks it up - it just doesn't do accept()'s quick enough to drain the queue in real time. So either we are generating more connections per second to the database or for some reason listener is slower. Because it was already late and we couldn't find any recent changes which would cause more connections to the database I decided to look at what listener actually does and how much time it takes. read() - over a network descriptor! Now let's look closely at timing. It took almost 0.3s (1.84-1.54 = 0.30) from accept() to finish handling that connection and move to another accept(). Assuming that would be an average time to handle one connection to the listener it would be able to process only about 3 connections per second! That's not much. Check the times I marked in red in above truss output and add these times: 0.0300+0.0542+0.0666+0.1298 = .2806. Remember that it took about 0.3s for entire loop to complete. So from the moment listener does fork1() to the moment it 2nd time reads from a pipe from a child it takes more than 90% of entire real time spent in handling a request. It calls cladm() 75 times and the total time it takes to just handle these 75 cladm()'s is about .11s - that's quite a lot of time compared to .28s spent in listener waiting for a child. If I could get rid of these cladm() I would almost double the connection rate listener can handle. I removed cluster keyword from the file and checked with truss again if it made any difference. 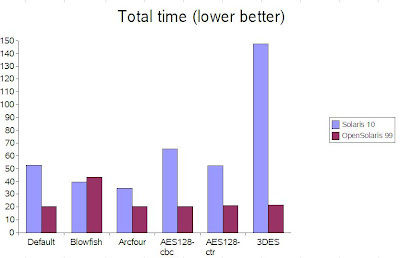 Now the timings are better and if you compare numbers you will see more than 35% of time reduction it takes for listener to wait for a child before it can move to process another request. It improves the connaction rate listener can do from 3.3 per second to about 5 per second. Why cladm() is being called 75 times each times Oracle process starts - I don't know, at first look looks like some bug in nss_cluster.so.1 library. It doesn't matter for now as it is a good workaround. Nevertheless it will have to be raised with Sun's support. The other issue is that system hasn't been patched recently and nssswitch.conf file hasn't been changed. So while it is good to see some performance improvement there must be something else which caused listener to process new connections more slowly. I manually confirmed if the change made any difference - now sqlplus client connect in less than 2s and the CGI script executes in shorter time. Puting the cluster keyword back and numbers got worse again. Removing it and numbers improve. Good. If you look closely again at timings you will notice that after cladm() was removed from the picture the majority of time listener spends now is waiting for two fork1()'s and execve() to complete. Now why would they be slower than before? I was almost certain it's not due to CPU but it could be due to memory and it rather has to be sometething related only to listener as once oracle process is up it does process requests as fast as usual. I checked how big is a listener process and it was over 400MB in size (RSS). We quickly set-up another listener on the box, listening on a different tcp port, and it turned out it was only about 23MB in size. We tried to connect to the database using the new listener and it took much less than a second. We switch over some traffic to new listener and it was able to process more requests per second. We could also verify it by writing simple dtrace script which measures number of accept()'s per second break down by PID. We left 2nd listener and reconfigured some clients tnsora files so they were load-balance between two listeners when establishing new connections to the database. That way we could compare both listeners and further convince our selfes that restart should help the performance. Knowing that basically listener loops between pollsys() syscalls while handling new connections I wrote a simple script showing time distribution it takes listener to handle a connection. Below yuo can see a sample output, where 25351 is a PID of the new listener and 15697 is a PID of the old listener which grew to over 400MB in size. We did restart the original listener and its performance was much better as expected. It turned out there is an Oracle's bug (5576565) which is a memory leak in listener causing a performance problem. Oracle provides Patch 5576565 which should fix the issue. When you think about Open Solaris you have mane really unique features there which you can't find on other platforms. Then there is a big market of customers who don't have or don't need proper skills to be able to use these tools - what they want is an appliance aproach, when you put something in your network and it just works for you. It would be great if one could get all the benefits of Open Solaris and yet didn't had to be a sr sys admin in order to be able to use them. When it comes to NAS appliances Fishworks is just that. It's like an NetApp filer but better - more flexible, more scalable, better performance and cheaper. You can find a good overview on new appliances here. Now it the environments I use to work I'm not that big enthusiast for appliances nevertheless I can appreciate them in environments they belong to - and I really believe that what they come up with will be a disruptive technology in a market where NetApp has almost a monopoly and is charging insane money for their proprietary technology. Don't get me wrong, NetApp does provide very good technology - it's just that it always has been overpriced and there was no real competition for them. Thanks to open source technologies like Open Solaris, ZFS, Dtrace, etc. it's no longer the case. Actually in the environments I used to work thanks to Open Solaris/ZFS NetApp usually is no longer an option at all. Now thanks to Fishworks you have the alternative for NetApp, and I believe it is a much better alternative. And for everyone for who it is important - Fishworks is built on top of open source software with file system being the most important building block. NetApp file system is a proprietary and closed and you end-up being locked-in by them to some degree. Almost two years ago I wrote one of my emails with observations about early Fishworks prototype and I was so exited with Analytics that I went wild and proposed to create Doctor D! - virtual advisor which would help you to tell what's wrong with your system and what you should do to improve the situation. Of course we can't deliver something like this in a forseable future. Nevertheless the Analytics gives you so much insight in a system that in essence you are becoming Doctor D! All you need to do is to correlate all forensic data presented to you in a very attractive manner. Of course it uses DTrace underneath, that's where D! is coming from, but because we are talking about appliance you don't have to know Dtrace or any other OS tools at all and yet still you can harnes the power of these tools and fix your issue. You can get more information on official Fishworks blog. Also check below blogs for more interesting info. How much code is Fishworks? Nice. That's how it should be - hopefully others will follow. In build 99 of Open Solaris among other new features one is quite interesting - out of the box use of built-in HW acceleration of UltraSparc T2 in ssh. It semms like it can deliver over 2x speed-up for scp. And yes, it's going to be back ported to Solaris 10. You can read more here. One of the missing features of Solaris used to be lack of Virtual Consoles - something we are accustomed so much in Linux. Solaris used to have virtual consoles once.. long long time ago, then they disappeared. Finally, they are coming back into Open Solaris and have been integrated into build 100. Now, how do I get an access to beta HW with Rock on board? What if you have a x86 system with lots of memory and you want to reboot it? It will probably take minutes before your system starts booting. What if you could bypass BIOS and POST testing and go directly to bootloader? Such a nice feature has been just integrated into Open Solaris build 100. See PSARC 2008/382 for more details. which allows a faster reboot that bypasses the BIOS and grub. NetApp introduced a new feature called PAM - Performance Acceleration Module. "In the simplest terms, the Performance Acceleration Module is a second-layer cache: a cache used to hold blocks evicted from the WAFL® buffer cache. (WAFL is the NetApp® Write Anywhere File Layout, which defines how NetApp lays out data on disk. The WAFL buffer cache is a read cache maintained by WAFL in system memory.) In a system without PAM, any attempt to read data that is not in system memory results in a disk read. With PAM, the storage system first checks to see whether a requested read has been cached in one of its installed modules before issuing a disk read. Data ONTAP® maintains a set of cache tags in system memory and can determine whether or not a block resides in PAM without accessing the card. This reduces access latency because only one DMA operation is required on a cache hit." Intel announced some time ago new line of SSD drives. For a consumer market the X-25M looks very promising. You can read reviews here and here. It's been five years since DTrace has been integrated into Solaris. It's one of the most important technologies in Operating Systems. Read Bryan's blog entry on last few hours before integration. I've just re-installed Open Solaris on my laptop using LiveCD. I was really surprised (positively) when NWAM detected my WiFi, asked me for WEP and during installation I could brows the Internet. However what really surprised me was that after install finished and I rebooted my laptop into Open Solaris it somehow remembered my password and got my WiFi automatically working without asking any questions - really cool. "On August 15, 2008, Solaris 7 exited EOSL Phase 2. Except through custom support agreements, all support for Solaris 7 is terminated. On April 1, 2009, Solaris 8 enters EOSL Phase 2. Vintage patch entitlement (for patches developed ON OR after 4/1/09) requires purchase of the Solaris 8 Vintage Patch Service. Learn more." More on transactional memory here and here. These two great tools were announced to be available to download for everyone. SWAT 3.0 and VDBench 4.07. Very interesting article written by Adam Leventhal. I actually like the idea of L2ARC especially on low-end systems. Imagine a 1U or 2U x86 box with one internal disk being a 143GB SSD used for L2ARC - basically you getting 144GB fast read cache for your MySQL database (or anything else). You probably can't even put that much memory in 1U or 2U system in a first place (not to mention cost). Now imagine much larger database. You buy additional entry-level array like Sun's 2540 and you put 12x143GB SSD drives for L2ARC (and at least one for SLOG if required). This gives you about 1,5TB of cache! You can cache relatively large database here. Now I like the way L2ARC works - if you unmount ZFS pool and mount it again old L2ARC content will be re-used (thanks to ZFS checksums possible stale data will be detected, skipped and read from disks). What it means is that if you connect your 2540 (or whatever) full of SSD drives to a cluster and you failover your database along with your ZFS pool to another node your 1,5TB of cache will be still warm. So the impact of failover on your database performance can be greatly reduced. The key point about DTrace is that it just works and does its job. Bryan posted interesting comment about SystemTap. Here is an update on the law-suit. If you are interested please also read a declaration by Dave Hitz. He basically does confess that NetApp is scared of ZFS and that it makes NetApp out of business. I agree - while I like NetApp from the economic point of view in most cases it doesn't make sense to buy it - build your storage box yourself using ZFS. Ok, you need certain skills to do so... but I'm 100% confident that sooner or later we will see appliances based on ZFS. Some of below links are outdated when it comes to some details but general ideas still hold. If you need to get ce interface working with IP instances with Zones on Solaris 10 - now you finally can. Go for patch 137086-01. Mac OS Server Edition code named Snow Leopard has been announced and they did include ZFS. "Heard of filebench? Want something similar for networking? Look no further! Today we opensourced uperf, a tool to benchmark networking performance. uperf, just like its cousin filebench,1 is a framework that takes a description of a workload/application (called a profile), and generates load to match the profile. uperf is quite heavily used by the performance groups at Sun to study networking performance." Google Translate adds 10 new languages, among them is Polish. Read more about it. ZFS had a problem with properly throttling intensive writers like a simple dd if=/dev/null of=/zfs/file which would usually produce "jumpy" writes instead os steady write stream. There is a new way of throttling in ZFS which should solve the problem - I have not tested it yet. The new code was integrated into build 87. Roch has posted a good explanation of the old and the new behavior. Interesting article on upcoming Rock CPU focused mostly on Scout Thread technology. Of course there is much much more. 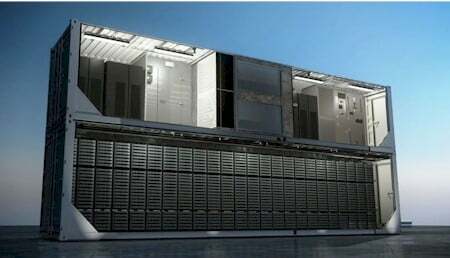 Sun has revealed two new Niagara servers: T5140 and T5240. Both of them have two UltraSparcT2+ processors which gives you 16 physical cores in a system with 128 threads in total. T5240, which is 2U version, also allows you to put up-to 16 SAS disks and up-to 128GB of memory - wow! Prices - recently Sun re-priced old Niagara systems and now you can buy T5240 with 2x Niagara for the same price you could buy old 1x CPU Niagara system just a week ago - cool. While T2+ has slighlty faster memory controllers but it has only two of them per CPU instead of four in T2... I wonder how it will impact performance. UPDATE: ZFS dedup finally integrated! With integration of this RFE we are closer (hopefully) to ZFS buil-in de-duplication. Read more on Eric's blog. Eric mentioned on his blog that in reality we should use sha256 or stronger. I would go even further - two modes, one mode you depend entirely on block checksum and the other one where you actually compare byte-by-byte given block to be 100% sure they are the same. Slower for some workloads but safe. Now, de-dup which "understands" your data would be even better (analyzing file contents - like emails, attachments and de-dup on attachment level, etc. ), nevertheless block level one would be a good start. Playground: 2x T5220, 1x 2530 SAS array, Solaris 10 U4, MPxIO, IPMP, Sun Cluster 3.2 with Zones agent, patch 126020-02 applied (support for Etude). Entire software is for free. Then you install Etude - just two packages. Export your Solaris 8 root file system over nfs or create a flar archive. Now you create a Solaris Branded Zone with Solaris 8 emulation providing exported Solaris 8 or flar archive as a source and a moment later you have a working copy of your Solaris 8 system in a Solaris 10 zone - cool! Now you configure that Zone under a cluster (couple of commands) and you got it clustered so you can switch that zone between systems. So far so good. Next week more functional tests and some basic application testing. If it will go well then we will switch production to it. Last phase? Create another Zone - this time Solaris 10 zone (standard one), put it under a cluster and migrate one by one applications between zones doing some cleaning at the same time. In a mean time we will provide better reliability due to clustering, better performance due to faster storage, more RAM and more CPU power. Not only it allows you to use recent HW and rapid migration, but since it's running on Solaris 10 you also benefit from technologies like ZFS (yes, etude zone can be on zfs), Dtrace, resource management, etc. How hard is it to set-up? Actually very easy, way easier than you think. The good thing is it's going to be very easy to use and is going to be integrated relatively soon - IIRC about build 92. It was also nice to be able to talk to him after his presentation and share some thoughts. If you are from London area I think it would be worthwhile to pop-in at LOSUG meeting - you can always learn something new or meet new people.